Highlights: Ellen Wittlinger is the author of fifteen YA and middle-grade novels. Her novel Hard Love won both a Printz Honor Award and a Lambda Literary Award. Her books have been on numerous ALA Best Books lists, Bank Street College of Education lists and state award lists. Ellen has won state awards in Michigan, Pennsylvania and Massachusetts. Her work has been translated into many other languages including Turkish, Croatian and Korean. 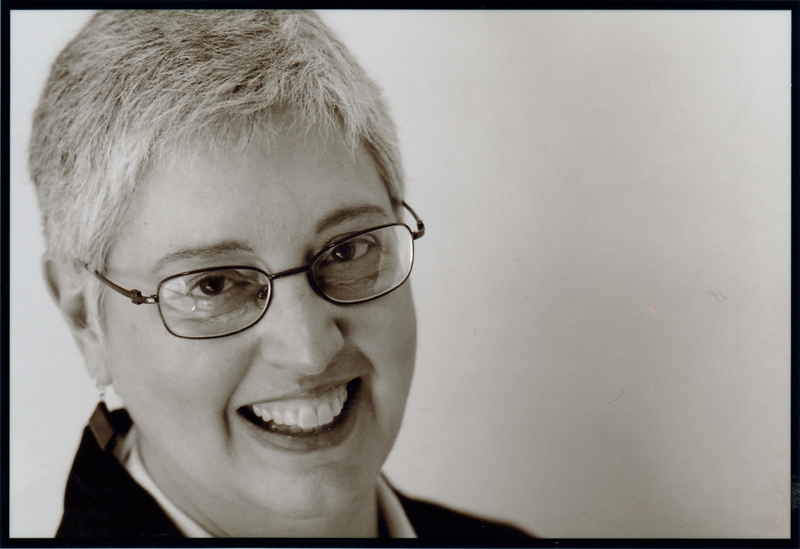 She has taught at Emerson College in Boston and in the Simmons College Writing for Children MFA program. For a high resolution head-shot click here. For Author Visits and other requests click here. Full Story: I was born in Belleville, Illinois on October 21, 1948, the only child of parents who owned a small neighborhood grocery store. We lived in a house that adjoined the store with only a screen door separating our dining room from the ice cream freezer and candy case. Sneaking Fudgcicles and Milky Ways was all too easy, and made me a popular kid in grade school. If this sounds familiar, perhaps you’ve read my novel, This Means War! which is as close as I’ve come to writing an autobiographical book. Like Juliet Klostermeyer in that book, my parents’ grocery store defined me, and the neighborhood was my world. My friends were mostly kids in the neighborhood. We skated the sidewalks, raced up and down the alley, and rode our bikes out into the cornfield countryside which was only a few blocks away. In high school I began to realize that I had certain academic strengths and weaknesses. Math was a weakness. German was a weakness. Science I enjoyed, but it didn’t always like me back. Art I loved, but the finished products never matched the ideas in my head. Okay, maybe there was only one strength: English class. This was the only place I really excelled. Teachers began to tell me I was a good writer, which was pretty exciting. So, off to college at Millikin University in Decatur, Illinois. I majored in Art because 1) drawing pictures is fun! and 2) I was afraid to be an English major. I was afraid of all that reading and thinking—the Chaucer and the Milton and the Shakespeare. How would I ever understand it all? I was afraid I wasn’t up to the challenge. But I continued to write, and pretty soon I loved the writing as much as I’d loved drawing pictures. A few years later I ended up in graduate school at the Iowa Writer’s Workshop at the University of Iowa. It was terrifying! Everybody there was a good writer. Was I good enough? My old insecurities came back, and I regretted that I hadn’t read all that great literature in college. I wished I’d mastered my fears and majored in English. But you can’t go back, so you go forward. Iowa was often a trial by fire, but when I finished there I knew that, yes, I was a real writer. After that I got two back-to-back fellowships at the Fine Arts Work Center in Provincetown, Massachusetts, a residential program on Cape Cod which nurtures young artists and writers. I wrote poetry and fiction there, and began to work on plays as well. If you’ve read my books Hard Love, Razzle, Love & Lies or the newest one, Local Girl Swept Away (out in spring 2016,) you know that I still like to set my novels on the Lower Cape. I fell in love with the look and feel and smell of that sandy spit of land that sticks out fearlessly into the Atlantic Ocean. In 1979 I published a book of poetry, Breakers, written in Iowa and Provincetown. Eventually I had to grow up. I moved back to mainland Massachusetts, got married, and had a couple of kids. I got a job as a children’s librarian and began to read the books on the shelves around me. The young adult novels were inspiring! Brock Cole, Katherine Paterson, Ron Koertge, M.E. Kerr: wow. I liked these books so much, I decided to try writing for young adults myself, and in 1993 my first YA novel, Lombardo’s Law, was published. There have been fourteen more since then. That little kid who stole Milky Ways from the candy case could never have imagined it. I have a book of poetry called Breakers which was published in 1979. My first YA novel, Lombardo’s Law, was published in 1993. They did, sometimes, but now they’re grown. There was a time when my daughter Kate was a lot like Bess in Gracie’s Girl. And my son Morgan asked me to base a secondary character in Razzle on him. So, Primo (he chose the name) is pretty much Morgan. But I reach back to my own teenage years to access the emotions. I used to say I wouldn’t do a sequel for fear it would disappoint fans of the original book. But so many people have asked for a sequel to Hard Love that I reconsidered. I always thought that getting into Marisol’s head would be fun, so Love and Lies is told from her perspective and begins a few months after Hard Love ends. Since it’s told in a different voice than Hard Love I guess it’s more a companion novel than a sequel. And yes, Gio is in this one too. Simple advice, but not always easy to follow. Read everything you can get your hands on, all sorts of different things—fiction, nonfiction, plays, poetry, newspapers, the toothpaste tube. And then, write. If possible, write every day. In doesn’t have to be great. A lot of it won’t even be good, but the exercise of writing keeps your mind limber the same way exercising your body keeps it limber. Don’t worry about publishing anything for a long time. You wouldn’t expect to play at Carnegie Hall the first year you took piano lessons–writing is no different. You have to practice a long time before you become proficient. Grace Paley, James Merrill, Ann Patchett, Nick Hornby, Marilynne Robinson, Jane Smiley, Katharine Patterson, Brock Cole, M.E. Kerr, Robert Cormier, Virginia Euwer Wolff, M.T. Anderson, Laura Ruby, John Green, Gary D. Schmidt and many more! Greg Brown, Lucinda Williams, Dar Williams, Richard Shindell, Lucy Kaplansky, Chris Smither, John Gorka, Cheryl Wheeler, and the Nields, to name a few. I’m still mourning the end of Buffy the Vampire Slayer, Freaks & Geeks and Friday Night Lights. (Actually, I’m still mourning the end of The X-Files.) I also loved Firefly, another Joss Whedon show–he’s the king of smart, funny TV. Current favorite shows are Sherlock (winner by a mile,) The Veep, Louie, The Mindy Project, Unbreakable Kimmy Schmidt. In movies: anything by Wes Anderson, Richard Linklater or Francois Truffaut. Loved Muriel’s Wedding and The Adventures of Priscilla, Queen of the Desert, both Aussie films full of ABBA music and very silly/poignant (my favorite combination.) Also adore Moonstruck (so Shakespearean!) and Tootsie. Breathless, The Big Chill, Harold and Maude, most Hitchcock. I love movies and will watch almost anything. Funny, it’s always been red, but I realize as I get older it seems to be changing to the more sedate hue of blue. Actually there’s not a color I don’t like. I love traveling (who doesn’t? ), but my husband says I only like to travel as an excuse to take pictures. I’m an avid photographer, although a real amateur. I love framing a shot–deciding this but not that. I was an art major in college and I still enjoy working with design, line, and color, even though the painting thing never worked out for me. 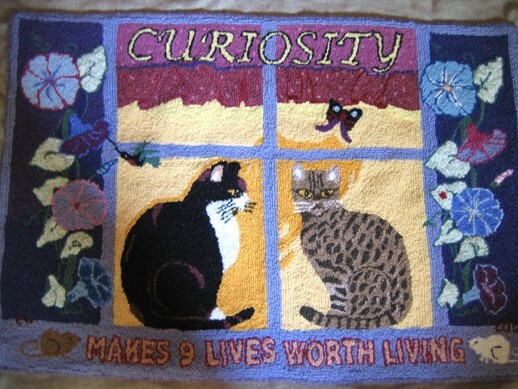 My newest passion along these lines is rug hooking–so much fun (see picture below, designed and hooked by me). I also enjoy gardening, but even more sitting in the garden after the work is done. Reading, of course, is more an addiction than a hobby.